Red Bull's strength over the last 5 or so years has been their ability to generate more efficient downforce than their opponents. 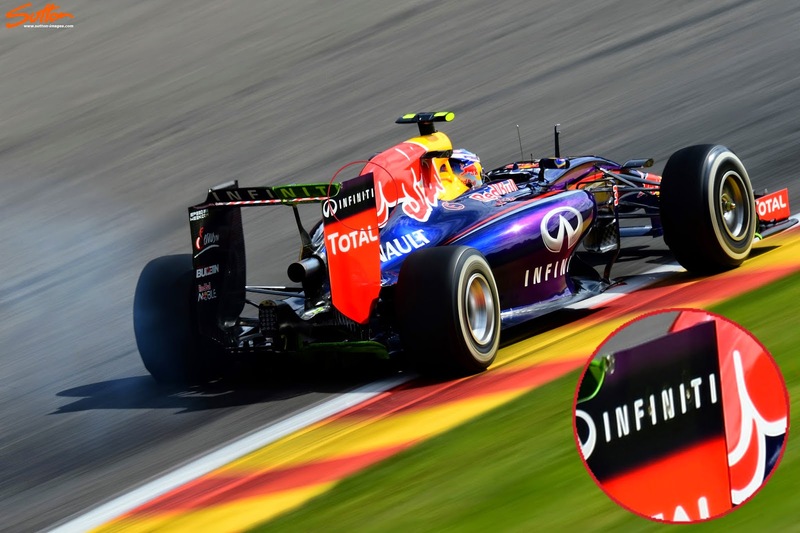 So it comes as no surprise that at Spa a circuit where being fast in a straight line is one of the largest performance factors, we see them utilize a skinnier rear wing. Of course in 2014 they're not only considering the deficit to their rivals in terms of direct aerodynamic drag reduction, but also with a top end speed disadvantage from the under-performing Renault powerunit, they have to make up further ground. Progress will have undoubtedly have been made by the French engine supplier over the summer break, with work continuing with Total (fuels and lubricants) to harness more power. That's not to say that Mercedes/Petronas and Ferrari/Shell haven't also been working hard on their fuel blends too though, making a gain on them even more difficult. 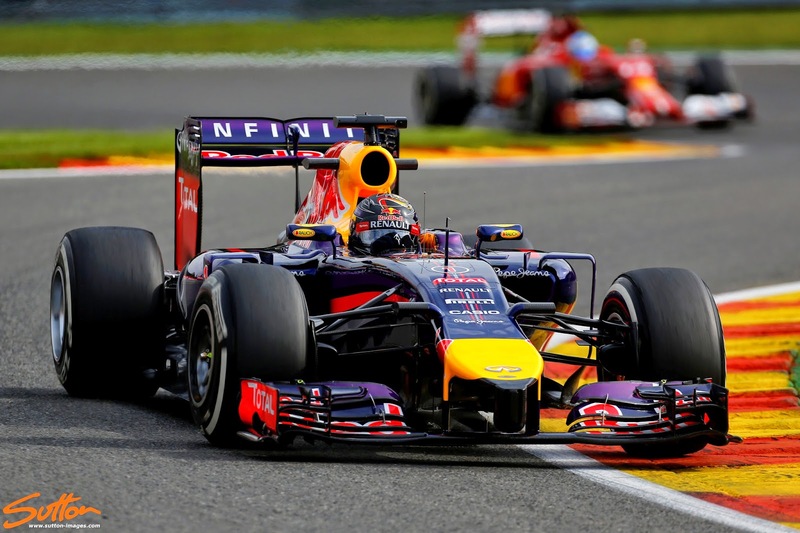 As we have seen in previous seasons Vettel (above) tested a different wing to his Australian counterpart with Ricciardo opting for perhaps the more aggressive solution, whereas the German retains a similar specification to the last few races, albeit with less Angle of Attack. 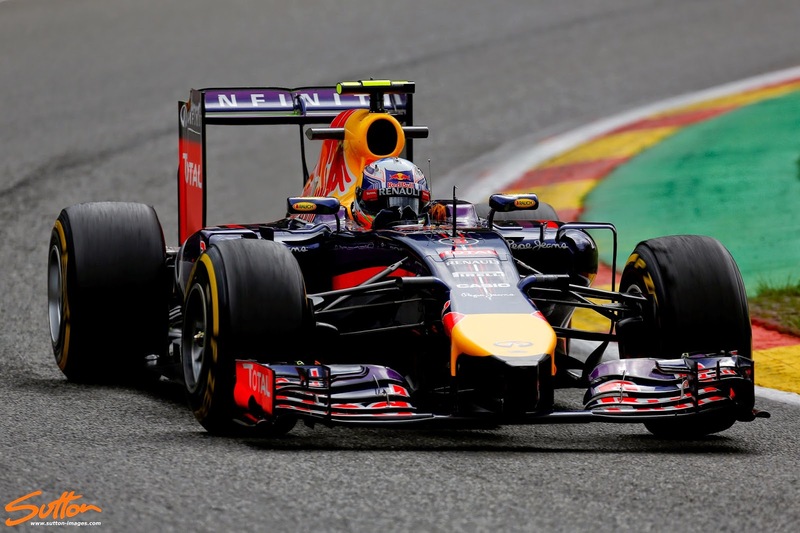 The rear wing being used by Ricciardo (above) features an extremely low angle of attack, something only marginally eclipsed by a Monza specification rear wing in previous seasons. 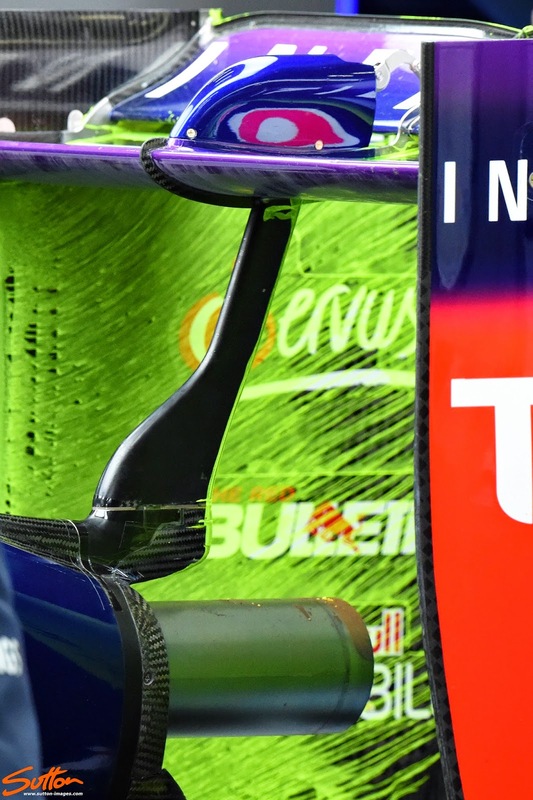 Red Bull's use of the secondary (upper) Y100 Winglet / Monkey Seat has been curtailed too, with it deemed unnecessary with such a low AoA rear wing. They retain the lower (beam wing slice) Y100 Winglet / Monkey Seat however, which retains its purpose of connecting the lower airflow structures (Diffuser/Floor) with the exhaust plume. The wing itself has had the leading edge tyre wake slots deleted and as the AoA is so low, they don't see the need to include louvres ahead of the wing planes in order to reduce tip vortices. Interesting though the top edge of the endplate has been made extremely thin to maximise the available width of the mainplane and top flap (see below). It could still turn out that Daniel was simply testing this wing for use in Monza, however it appears that he is far less sensitive to a loose rear end than Vettel, probably owing to his time spent at Toro Rosso with a less aggressive blown diffuser over the last few seasons. IF they choose to run different specifications for qualifying/race it'll be interesting to see the offset in terms of tyre degradation, where Daniel should suffer from graining much earlier into the race due to the lateral loads put through the tyres in sector 2. Note: As this analysis was written post FP2 I can now confirm that both Red Bull drivers used the skinnier rear wing for Qualifying/Race even with the damp conditions.